Anyway, back to our topic.. 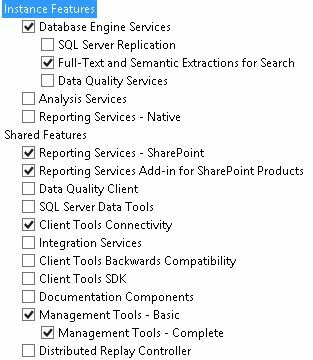 Recently i was working on a SharePoint 2013 environment setup, where you do the classics, such as provisioning DEV, QA, and PROD environments. It was a very sophisticated piece of hardware where I was using vSphere 5 to manage the hosts, VMs, LUNs, etc. It was an amazing learning curve for me and made me realize once again while working with SharePoint at the application layer, actually how much we are missing or taking things granted happening on the infrastructure level. Getting this to work error-free with your environment is most of the work, believe me. By now, I think i know thousand ways of not building a SharePoint farm properly. It’s important to mention that AutoSPInstaller won’t do all the magic for you, although it’ll handle most of it quite smoothly. One of the first things to do is to prepare your topology accordingly so that AutoSPInstaller can run error-free. At this point, assuming that your servers will be hosted by VMs, we need to get all servers – DBs, Apps, WFEs – to a point that all prerequisites are installed and configured properly, before running the automated parallel deployment scripts. This is also the time you get a snapshot of all servers and maybe call it “Starting Image”. This will allow you to go back and launch the installer again and again w/o worrying about preparing the servers from scratch. (Optional) Configure the Windows Update settings. 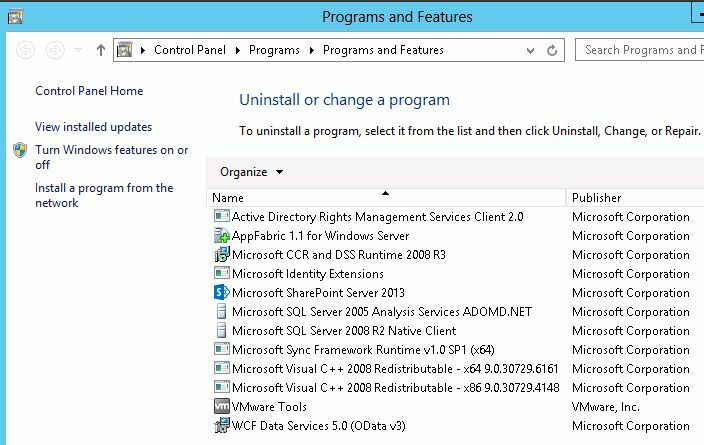 (Optional) If you have a Windows Server 2012 product key, activate the Windows operating system. Above first four PowerShell scripted steps should be good to go to prepare our OS-Template VM. Optionally you can configure Windows Update settings and activate the Windows OS. Once done, take a snapshot of this VM and call it “OS-Template“. Going forward this will be our first base and any other VM templates will be cloned from this one, such as DB-Template or SP-Template. Now that you have your OS-Template snapshot, you can easily convert it into a template VM. 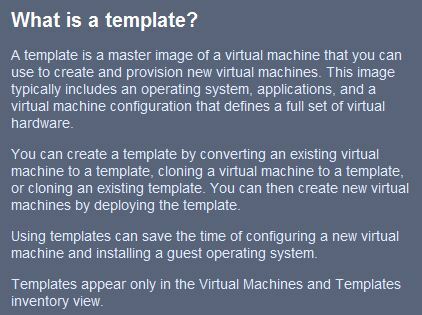 Here is a quick definition of what a VM Template is. Go ahead and spin another VM using OS-Template. This will be your DB-Template VM. Now you can install SQL Server 2012 SP1. Feel free to install with default settings either using UI or unattended installation. SQL Server 2012 AlwaysOn does not require SQL instances to be clustered, so when we configure AlwaysOn in the following posts, default instances will work just fine. Note that still this VM is not joined to the domain, no service account are created, …etc since currently we are just configuring individual VM templates. 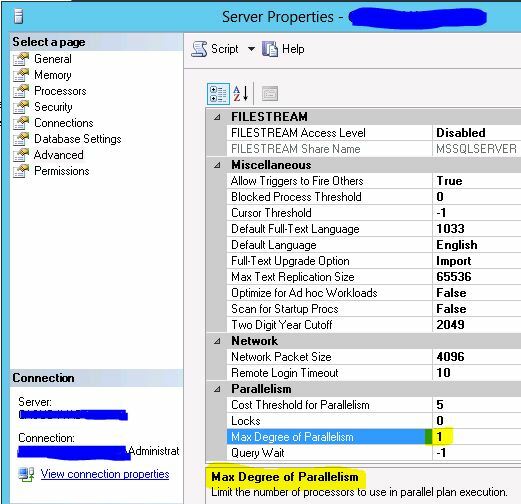 Once we clone from these templates to create our 3-tier farm topology, then all VMs will be joined to the domain, we are not there yet..
Configure the Named Pipes protocol using the SQL Server Configuration Manager. Max. Degree of Parallelism set to 1. Above is just a couple of items to set before we save this VM as our DB-Template. Once they are done, shut down your VM and take a snapshot called “DB-Template“. Now, we are done with our DB-Template. Go ahead and convert this snapshot to VM Template and spin 2 DB VMs from it. Those identical DB VMs will be our DB1 and DB2 servers of our topology. We’ll use AutoSPInstaller to take care of it, simply with one-click. Now it’s time to jump to AutoSPInstaller topic and see how to structure it. 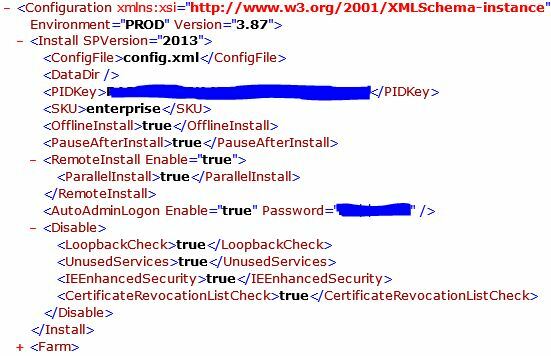 Here i’m not gonna go into details of Input.xml and its options. Simply i’m trying to get above installed to create a template. Remember, we are not deploying and configuring the farm now. We are just trying to get SP binaries installed. We could have easily left this part to AutoSPInstaller while performing parallel installation but believe me, the amount of time you’ll save by doing this in advance is simply priceless. 1. 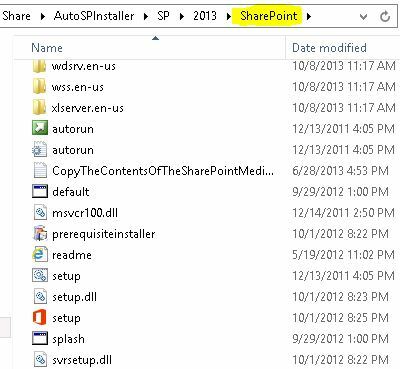 Copy SharePoint binaries under SharePoint folder. 2. 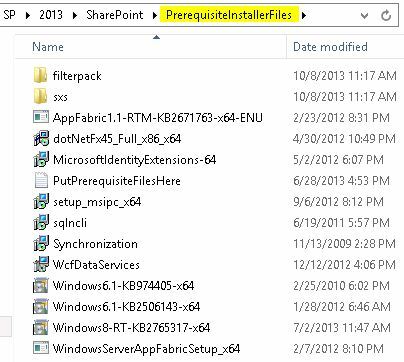 Copy all the prerequisites installer files under PrerequisiteInstallerFiles folder under SharePoint folder. In order to download the following prerequisite installer files, you can use the script provided below. Once you download these files, simply copy them to your AutoSPInstaller directory shown below. 3. Copy .Net Framework 3.5 installer under sxs folder. At this point we are almost ready to run AutoSPInstaller to install the binaries. But we need to add this VM to domain now to run AutoSPInstaller. I’ll explain the details of it later. But for now we just want to get binaries installed. 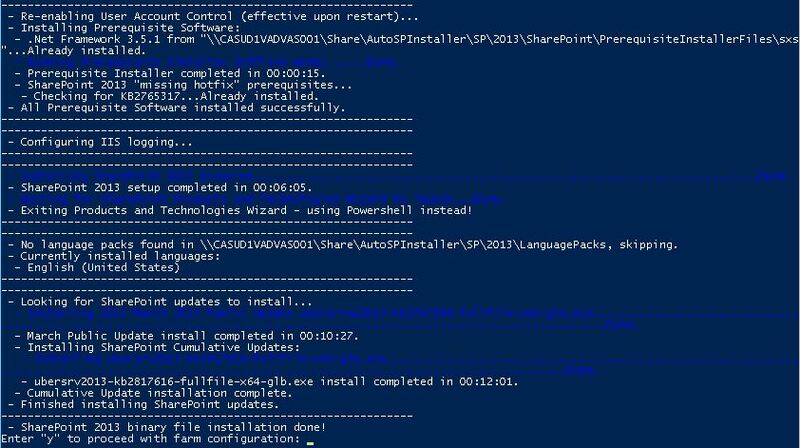 AutoSPInstaller will install all prerequisites, SharePoint 2013 binaries and updates as shown above. Then, it’ll ask you if you want to proceed with farm deployment. Since we are building SP-Template VM right now, we’ll stop here, shut down our VM and take a snapshot, call it “SP-Template“. Milestone – Topology Template VMs are ready! You can see the above activity performed as your investment for your SharePoint infrastructure. Regardless of how many farms you provision, such as DEV, QA, PROD; now you can use these templates to clone your VMs from. 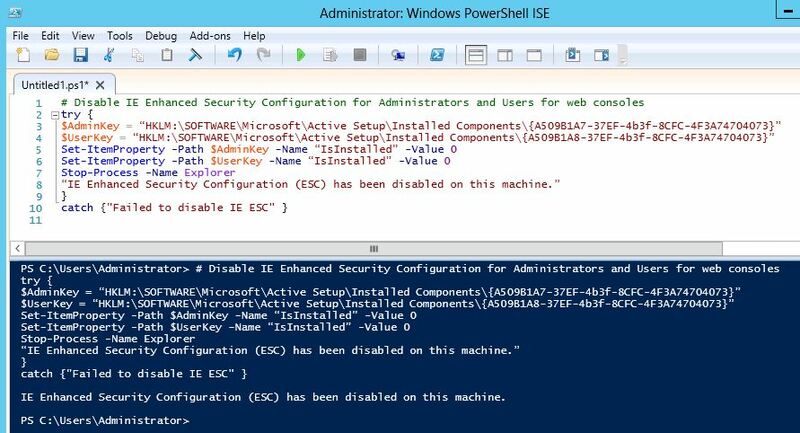 Once you create your VM instances, make sure you add them to your domain, setup local admin passowords, and now you are good to go for the next part, which is indeed where the real action happens – parallel remote SharePoint 2013 farm deployment and configuration. Before we go back and start talking on how to prepare AutoSPInstaller setup for our topology, let’s figure out our logical architecture and naming conventions. Your naming convention might be different based on your organizational needs. For the rest of the article i’ll refer to above computer names. Also we need a set of Service Accounts to be created in advance. 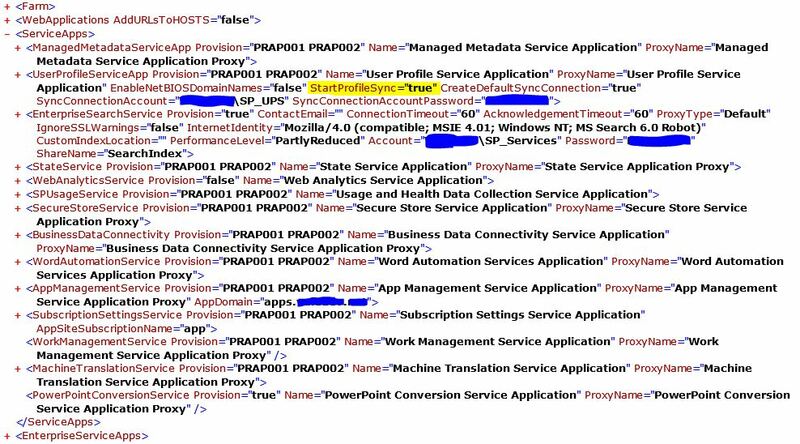 Those are 2 SQL Server service accounts (sp13prodsqlagent and sp13prodsqlengine) and SharePoint Service accounts as follows. 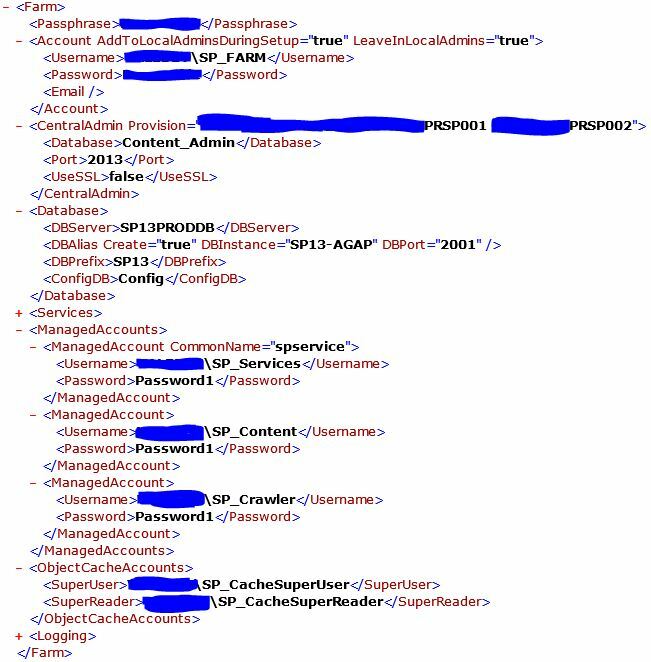 AutoSPInstallerInput.xml file is the heart of farm provisioning and configuration. Once you launch AutoSPInstallerLaunch, it will use this input file to figure out the servers in the topology, which servers have which roles (app or wfe), which server will host central admin, search components, web sites, …etc. When I was going through this exercise, it took me quite sometime to really understand which attributes to use and how to use them, for an effective 3-tier farm deployment. So, I’ll try to document here as much as i can with the details. AutoAdminLogon Password – provide your SharePoint Setup Account password here. This is the account which will be used to login when server is restarted. Local Admin on all servers, possibly a domain administrator account. 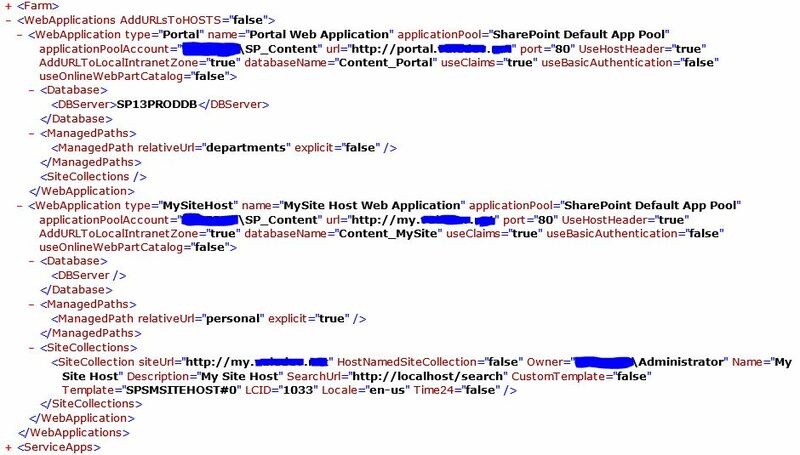 CentralAdmin Provision – provide computernames of your SharePoint WFEs. Ex: xxxxPRSP001 and xxxxPRSP002. Note that there is only space between computernames. No comas, no semi-columns. Database DBServer – provide the alias for your SharePoint instance. Regardless if they are clustered or not, use db alias here. In my case, I enabled SQL Server 2012 AlwaysOn Availability Groups, so I have SP13-AGAP, which my availability group’s access point, which is on port 2001. More to come on that..
Domain Name – In attributes, provide your own domain name. This is where we identify Service Apps Topology. i.e. this is the critical part where we defined which service apps will be provisioned on which servers, such as AppServer1, AppServer2. By default, i’m provisioning all service apps on both AppServers named as PRAP001 and PRAP002. Provision – replace server names with your own app server computer names. StartProfileSync – Note that we are also starting User Profile Synchronization Service. I know, it’s like magic, ain’t it? But best part is – it works! CreateDefaultSyncConnection – this is set to true. We are also creating the a sync connection. For that don’t forget to give appropriate AD permissions to SP_UPS account and provide its password. 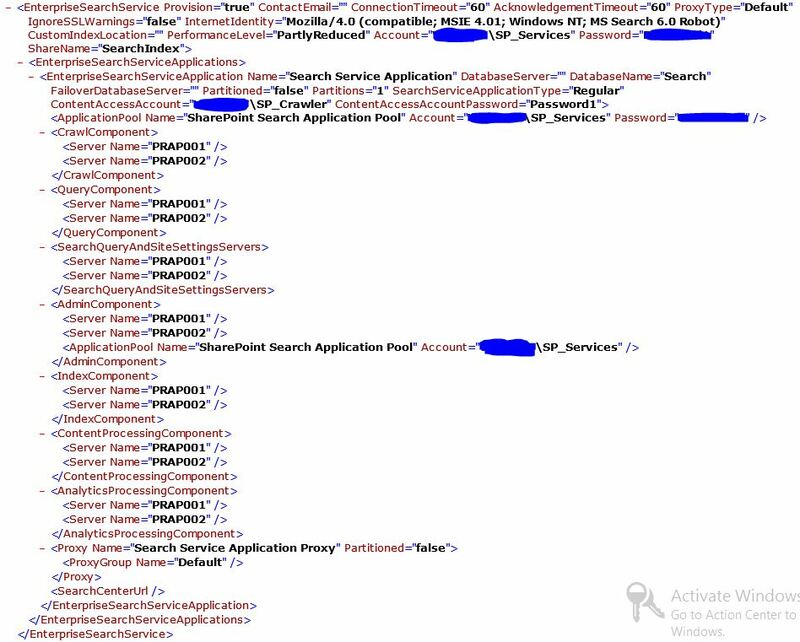 Excel Services Provision – replace server names with your own app server computer names. Other Enterprise Service Apps are not provisioned as for this example. If you decide to provision them as well, just make sure that you create their dedicated service account in advance. I also prepared a little cmd to be used with FNR tool (find and replace tool, which you can find on CodePlex here). This will help to replace the correct parameters. Now it’s time to recap.. Let’s see where we are at now with automation, deployment, and identify what the gaps are to get this environment PROD ready. 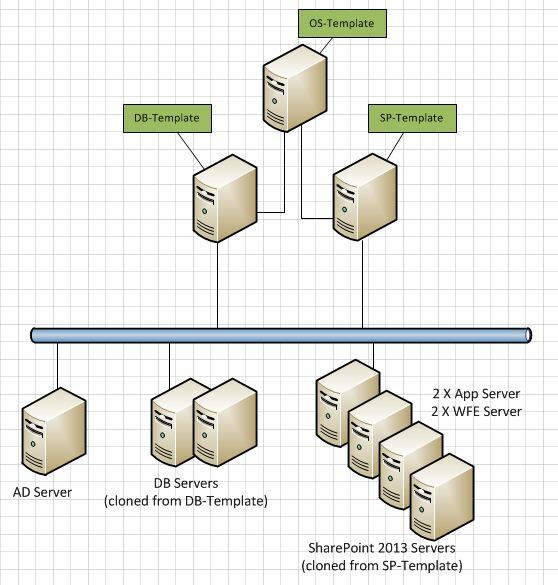 So far, we have 3 VM Templates and 6 Servers (2 DB, 2 App, 2 WFE) as shown below, where all 4 SharePoint 2013 Servers were deployed and configured remotely. In the next post, I’ll try to show how to configure SQL Server 2012 AlwaysOn Availability Groups from SharePoint 2013 content and admin databases. This entry was posted on January 2, 2014 at 12:09 pm	and is filed under SharePoint. Tagged: 3-tier, AutoSPInstaller, deployment, install, parallel, sharepoint, sharepoint 2013, VM. You can follow any responses to this entry through the RSS 2.0 feed. You can leave a response, or trackback from your own site.